Book a skilled lawn pro in Tucson. Backed by a total satisfaction guarantee and amazing customer support. Looking for lawn care services in Tucson, Arizona? Lawn Love has you covered. We're bringing lawn care services to the 21st century. Get an instant quote for lawn care services near you such as lawn aeration, lawn mowing, leaf removal, gutter cleaning, gardening, yard care, weed control and more. 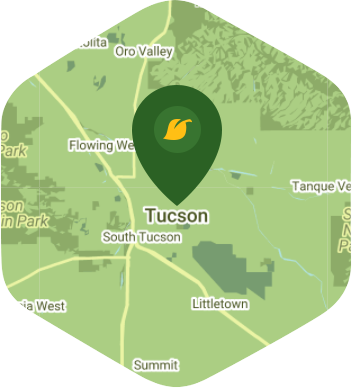 See why we're rated the #1 lawn care service company in the Tucson area. Living in the middle of the desert may not make many people think of lawn care, but you know better. Growing grass in the desert can be a challenge – and at the very least it's time-consuming. Still, coming home to a landscaped piece of heaven at the end of a tough week is worth the work, if you've got the time, that is. If you're constantly juggling your desire for an oasis in the desert with the demands of work, school, and a social life, then Lawn Love is here to help. Lawn Love is a fully insured and bonded lawn care company. Our teams of experienced and skilled lawn care technicians want to work with you to make your lawn dreams come true. We can take care of the watering, seeding, weeding, trimming, mowing, and clean up – all you have to do is give us a call in order to find out more! To take advantage of our free, fast and easy two-minute quote, call us today at 520-999-2652 and find out how Lawn Love can help you turn your slice of arid desert into a lush oasis! Michael and his team a HUGE weed situation to deal with at our house. They completed the job in3 hours for a VERY fair rate. Use them and you wont be disappointed! Michael did a great job, now the front and back yard is beautiful. You can clearly tell the work is done by professional. Michael keep me posted in the real time for all the details. Super professional!! Rated 4.76 / 5 stars in 100,648 Lawn Love customer reviews. There won't be any rain in Tucson today, which means you'll probably have to water your lawn. Dusk and dawn are the best times to water your lawn (the sun will rise at 5:44 AM and set at 6:59 PM today in Tucson). Here are some average lawn care prices for homes in Tucson. Average lawn size 3,539 sq. ft.